Print your logo onto these custom printed flourish gloss eco cornstarch pots with seeds or one of our other innovative gift packs and use them in your next marketing campaign as a unique giveaway item. Flourish Gloss Eco Cornstarch Pots With Seeds are a fantastic eco friendly giveaway that will biodegrade. you can give them out events or gifts to encourage environmentally friendly and eco branding. Grow your own herb, flower, native plant or fruit or vegetable with our promotional Cornstarch Seed Pot. Great for environmental promotions or gardening centres. 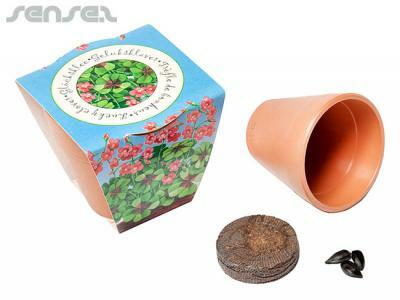 These are a fantastic gift with a little pot and your choice of seeds and just watch them grow. Kids love watering and watching their little plants grow. Great as an office gift to grow fresh and green plants. Custom brand these a4 compendiums with zipper or one of our best-selling promotional gift packs with your company logo! Personalise your flourish gloss eco cornstarch pots with seeds or custom design gift packs for your marketing campaign. How can these unique promotional flourish gloss eco cornstarch pots with seeds or our personalised gift packs fit in with your marketing strategy and help you maximise your brand exposure? Our custom made Flourish Gloss Eco Cornstarch Pots With Seeds can be produced from a minimum quantity of 250 pieces. We can have your logo branded on these corporate Flourish Gloss Eco Cornstarch Pots With Seeds in Full Colour Digital Print. A setup fee of AU$180.00 will apply to make the film.